On the first day of summer, Saturday, June 21, 2008, sixty urban planners, environmentalists, public health experts, artists, and community activists boarded Amtrak’s Surfliner at Union Station to participate in a day long mobile conference between the cities of Los Angeles, CA and Tijuana, Baja California. 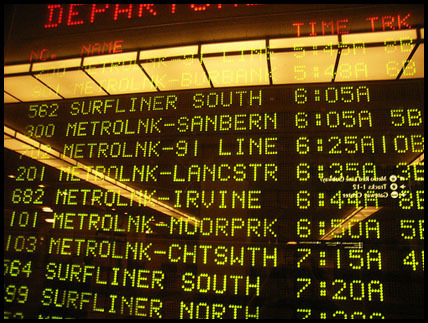 Checking the board at Union Station for the Surfliner. The mission of this conference was to explore and to understand this region by accomplishing the following five goals, 1) experience the built and natural environment, 2) understand the relations between land use, transportation, and social patterns, 3) learn about the current environmental and health issues, 4) network with like-minded people across the region, and 5) have fun. While the conference surpassed these expectations and accomplished these goals by being innovative and involving participatory practices, it also allowed participants to discuss land use, watershed, and social issues in a very unique and powerful way. The LA-TJ Corridor is one of the most prosperous metropolitan regions in the world and contains very diverse landscapes, cultures, incomes levels and approaches to urban planning. The route explored the backside of the region often hidden from the freeways that traverse the same areas and highlighted the diversity of land uses in the region. The route highlighted all of these elements by traversing through spectacular natural settings and the most environmentally degraded sites. The mobile conference brought together both man-made systems such as transportation and land use patterns with natural systems such as rivers and water sheds. The top deck of the rail car was reserved for the conference participants to provide optimum viewing of the sites along the corridor from Los Angeles to San Diego. The fourteen conference speakers added valuable political and social insights to the forces shaping the landscape and built environment. They were orchestrated in tune with the shifting landscape along the route, and they tailored their presentations around the built environment and natural features. The visual cues in the landscape became a power point presentation for the participants as they gazed out the train's windows. After a brief welcome, Lupe Vela from Councilmen Ed Reyes Office updated us on the L.A. River Master Plan. During her talk, the morning sun shined from the east, illuminating the silver band of the LA River trapped in a coffin of concrete. The train rolled under the historic viaducts, crisscrossing the river and passing through the graffiti concrete walls of the river basin. As the train crossed over the LA River and headed southeast, the river bank along the rail road tracks gave way to large distribution warehouses. The scrap metal from a recycling facility shimmered in the morning light against the dull industrial landscape. Attorney Tim Grabiel from the Natural Resources Defense Council spoke on goods movement and transportation issues. His talk highlighted the massive industrial Hobart Rail Yard, one of the largest inter-modal facilities in the US. Associate Professor Andrea Hricko from USC continued by talking about the health impacts of air pollution from rail yards and truck-congested freeways, all a result of international trade through the Ports of L.A. and Long Beach. The industrial landscape of South East Los Angeles County gave way to the small suburban homes of Montebello and Pico Rivera. At this point the train crosses over the Rio Honda and San Gabriel Rivers. Transportation planner Nathan Braid from Amigos de los Rios spoke about their current work creating bike paths along these rivers. As the train headed south, the miles and miles of warehouses and bleak industrial landscape of Los Angeles County gave way to greener landscapes in Orange County. After about a half hour of travel, the train finally stopped at our first stop, Fullerton Station. Like Orange and Santa Ana Stations, there was a tremendous amount of new housing construction of high density housing units or transit-oriented developments (TODs), which illustrated how mass transit is playing a new role in the development of housing. Next, the Anaheim Stadium Train Stop -- with its acres of surface parking -- illustrated one of the many things wrong with the region. Martin Schlageter from the Clean Air Coalition spoke about what his group is doing to clean the air by changing these types of land use patterns. As the train headed south to Irvine, large parcels of undeveloped land appeared. Landscape architect Mia Lehrer spoke on her work in the design of Irvine's Great Park, which was the former El Toro Air force base. The train passed by the quant mission town of San Juan Capistrano as it begins its route along the coast. The train traveled very close to the ocean, so there was a clear view of the beach goers and surfers. This is the idealized Southern California lifestyle. With out a car in the work, the largely middle class enjoyed a day at the beach. Here bike lanes, large houses and well landscaped street create this wealthy enclave. Damon Nagami with the Natural Resources Defense Council spoke about his group's efforts to stop the Foothill-South Toll Road from destroying San Onofre State Beach – the fifth most visited State Park in California, which is home to several endangered species and some of the last remaining pristine coastal parklands in Southern California. The train passed along Camp Pendleton, which is the only remaining undeveloped land. This area breaks the develop patterns between the Los Angeles Region and San Diego County. Alfredo Gonzales from The Nature Conservancy and Mary Loevan spoke on watershed issues in Southern California as we past the few remaining estuaries in the region as the train enters San Diego County. Urban planner Guillermo Jaimes made the concluding remarks for the train trip. Conference goers in San Diego. The train arrived around 11:20 a.m. at the historic Santa Fe Station in San Diego, which has become an inter-modal transportation center with commuter rail and trolley cars making stops here. Large elegant housing towers under construction dominate this area. At the Santa Fe Station we boarded the trolley south to San Ysidro. Along the forty-five minute trolley ride, community organizer Maria Moya from the Environmental Health Coalition with National City, spoke about the land uses and planning issues they are working on in the area south of Downtown San Diego all the way to the Mexican boarder. The trolley route runs through shipyards and industrial zones similar to what we saw in Los Angeles. At the end of the Trolley Ride, Connery Cepeda, a Transportation Planner for Caltrans District 11 highlighted work they have done to improve pedestrian and bike travel along and through the border. Cepeda also spoke about the future transportation planning work take place between the border region at the San Ysidro Point of Entry. After exiting Friendship Plaza, we entered Tijuana by foot though a maze of concrete walkways and metal gates that made a loud clinking sound as you passed them. In Mexico we walked to the Casa De Tunnel, which in the past, people would use the tunnel in its basement to cross the border into the US. On the roof of the Casa, we had a great lunch sponsored by The Nature Conservancy. During lunch Oscar Romo from the California State Parks spoke about watershed issues facing the Tijuana and San Diego Region. After lunch we broke up into four groups to do a walking tour of Downtown Tijuana. Cal Poly student, Robert Machuca, mapped the route to include the red light district, La Revo (Revolution Street), and shopping areas. For around an hour, the four groups meandered the city in a kind of pseudo-planned urban walking tour that can only be understood in an abundantly informal context. Tijuana engaged us through its human urbanism. From the small children begging for money, to the people making tacos on the streets, we found ourselves bombarded by people – a refreshing change from the isolated streets north of the border. Tijuana illustrated a humble city where people including the conference participants, are both users and creators of a place and thus become texture in the vibrant urban landscape. After the walk, many of the participants stop for one dollar beers and tacos before we headed back to the border and north. A nice change from the three plus dollars it would cost just on the other side of the border. Land use issues are best taught by experiencing them through all of our senses. "LA" gave way to "TJ," and without any notice, participants experienced the dynamic reality of an informal urbanism. In this way, through an experiential reckoning, the intricacies of the varied environments left their impression on the participants, informing them about the complexities of urban planning in our region. The Los Angeles to Tijuana Mobile Conference created a unique learning experience for not only the fourteen speakers who presented local land use issues, but also the sixty participants. This technique turned out to be a very effective and powerful way to discuss issues such as land use, watershed, and social issues. 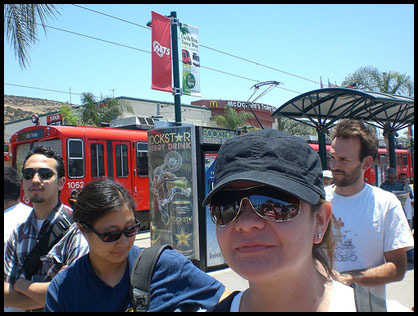 By venturing out into the field and ingeniously using various forms of transportation from train, trolley, and foot, the mobile tour was able to help participants experience the built environment and landscape of this region in a very distinctive way. Finally, this allowed participants to frame local issues into a large regional framework so they may judge for themselves, what they experienced, shapes the region. James Rojas is one of the few experts who examine US Latino cultural influences on urban design. He holds a Master of City Planning and a Master of Science of Architecture Studies from MIT. His thesis on the Latino built environment has been cited in the LA Times, New York Times and in numerous magazines and books. Currently, Mr. Rojas is a project manager for the Los Angeles County Metropolitan Transportation Authority, Central Area Team. He works on transportation enhancements projects and oversees millions of dollars of urban design, bike and pedestrian projects for Los Angeles County, and is part of the Eastside Rail Community Linkages Project. He is currently a board member of Livable Places and the East L.A. Community Arts and Mural Program.